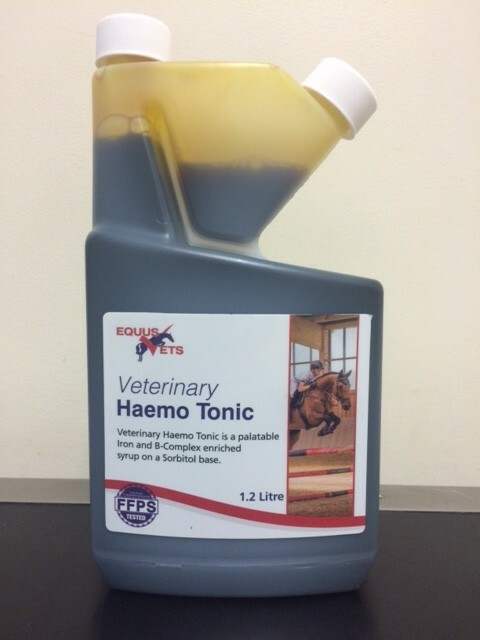 Equus Vets Veterinary Haemotonic is a highly absorbable and extremely palatable Iron, B-complex and cobalt-enriched syrup on a Sorbitol base. Recommended for performance horses, the Haemotonic will also act as an exceptional pick-me-up for post viral uses and post-operative cases where horses may have lost appetite or horses which have poor overall condition. High levels of Vitamin B12 ensure red blood cell formation and keeps metabolic functions well maintained. For all horses and large ponies 30ml should be given twice daily. For small ponies, yearlings and foals 30ml should be given once daily. Equus Vets Veterinary Haemotonic is competition legal.